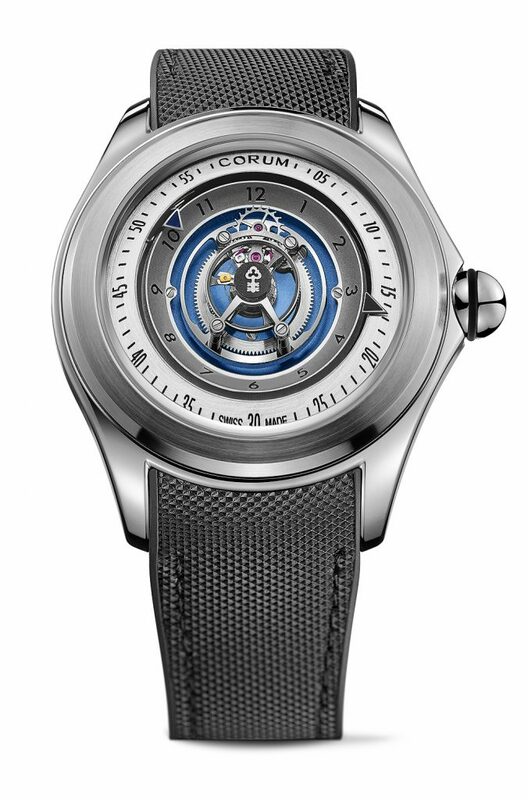 Corum Bubble 27mm Central Tourbillon (Swoosh) watch. There were some really interesting new tourbillons watches introduced at Baselworld this year, but one of the outstanding watches comes in the form of a beloved Corum Bubble: the Corum Bubble Central Tourbillon (aka, Bubble 47 Swoosh). The Bubble, for those who may not know, is an iconic watch with half-a-sphere raised sapphire crystal that allows for an incredible view of the dial. The Corum Bubble was introduced by Corum in the early 2000’s and was an immediate sensation. In the past few years, the brand has put a strategic focus on brining the Corum — with its wild and fun motifs — into the foreground again. Each year, the brand seems to find ways to top itself with creative new watches,including special art pieces, and this year with the Corum Bubble Central Tourbillon, the brand has stepped up the benchmark. Corum 18-karat rose gold 47mm Bubble Central Tourbillon watch with a bi-directional rotor and offering 65 hours of power reserve. 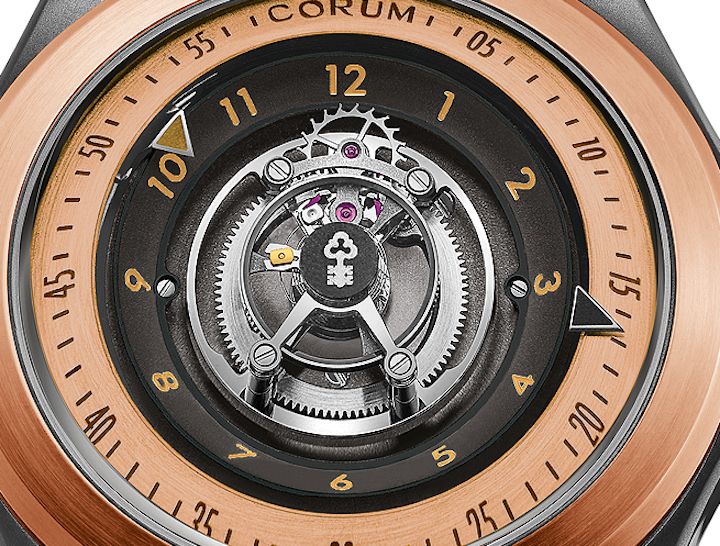 The Corum Bubble Central Tourbillon is a 47mm case made in either titanium, titanium black PVD, or 18-karat rose gold. The watch is equipped with the highly complex self-winding CO 406 movement with a bi-directional rotor and offering 65 hours of power reserve. With the sapphire domed crystal, one can get a magnified view of the constantly whirling mechanical wonder that — so as not to block the view of the tourbillon escapement — indicates the time on the dial flange. The hours are displayed using colored triangle and the minutes are indicated via a black triangle. What’s the retail: Titanium with black rubber strap, $76,500, titanium on Milanese mesh bracelet $77,000 and 18-karat gold on black rubber strap is $83,000. Here, we bring you a video of the watch.